LotusTalk - The Lotus Cars Community > Lotus Discussions > Lotus Elise > Should this part be loose? I spotted this handle while my trunk was open today. I never saw it before (my car is only a week old!) so I dont know its normal state. The white handle is dangling there, not really secure at all. It feels broken but I Just dont know. See photo below. Thoughts? 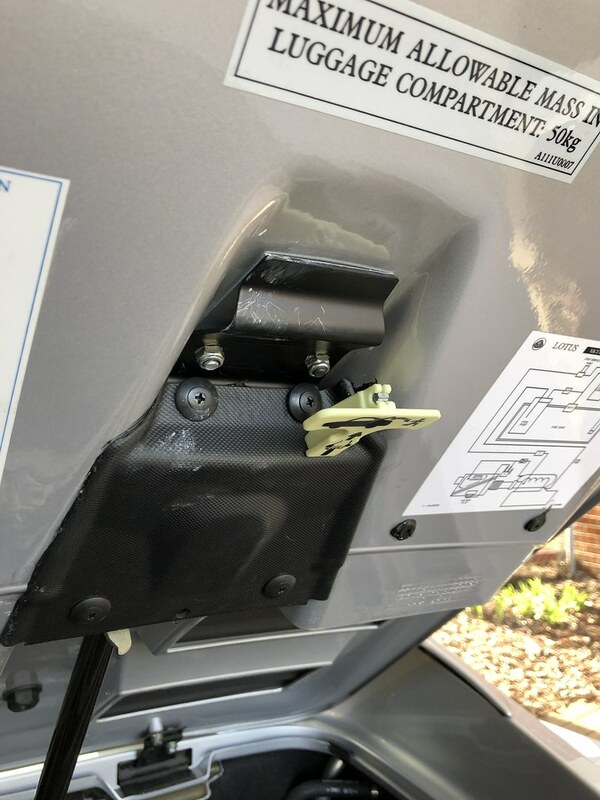 If you really want to test it, you can unscrew the locking pin down below (attached the trunk wall near the exhasut) then press it into the locked position. Basically, simulate shutting the trunk but my moving the locking pin instead of the trunk lid. Then pull the handle and see if it releases. Should that piece be hanging free as it is in my car? That is what I want to know. Thank you. OK, thank you. All is normal it seems. It just seemed so odd having that piece moving about, rather than secured. That's what I thought this handle was for, but my goodness, that trunk is small. Would a toddler know to use that handle?? That's the standard joke, yes. This is what happens when DOT or NHTSA makes a regulation without thinking all the cases through. It would have been trivial for them to say 'in excess of 5 cu ft' but they didn't. The stupid little GITD handle (and associated latch) is one of the things Lotus had to do to make the car legal for sale in the USA. I used to know the progression of children's grip development. I no longer do. But, if a child or adult with limited movement or deftness has to grab something, it is easier if that item is a bit loose. Think about it. And, have you not noticed these things in almost every car in the country?? You said it feels broken; it is normally attached like any other handle I've ever seen (just by the tension in the cable which is not much), so if it doesn't feel like that then there may be an issue. I actually did have mine break, so there was no resistance when pulling the release. I had mine out from taking rear clam off in the past. I put it back cause it's so silly and fun to point out to people. Motard and brytee like this. I forgot about that video! She is such a fun and game girl! I had a problem once with the handle in my car. I had the trunk very tightly packed for a road trip and that pushed that handle into a position in which it could not move. When you unlock the trunk using the key, that handle needs to move a bit. In my case because it was stuck the trunk would not open. After many hours of fiddling around, I guess it moved enough for the key to turn the lock. As a result of all of that, I removed the plastic handle.